WARNING: This review will get spoilerly and rantish after the first paragraph. Stop reading after that if you care about spoilers. Ever since Geoff Johns and Peter Tomasi left their respective books, I feared this moment might come. And now it is here - the moment I can no longer justify supporting the Green Lantern and Green Lantern Corps titles. Understand this - the books by Robert Venditti and Van Jansen have been well-written and engaging. This annual, too, has a good story and good artwork. But after reading Green Lantern Annual #2, three things have become apparent to me. 1. You HAVE to read all the Green Lantern family of books now. Despite being an annual for the Green Lantern book itself, this issue is really meant to cover all of the titles in the Green Lantern "family", including Red Lanterns and New Guardians. This has become an increasing problem in many New 52 DC Comics titles. Indeed, it's the reason I dropped Supergirl, which has become increasingly interdependent on a bunch of Superman books I have no interest in reading. 2. There's No Point To Kyle Rayner Existing Except As Nostalgia Fodder. And I say that as someone who got into comics BECAUSE of Kyle Rayner. If you needed any proof that certain aspects of The New 52 universe were not planned at all, one need only look at The New Guardians title. For the first year, it told the story of an attempt to build a team with one member of each of the various Lantern Corps. 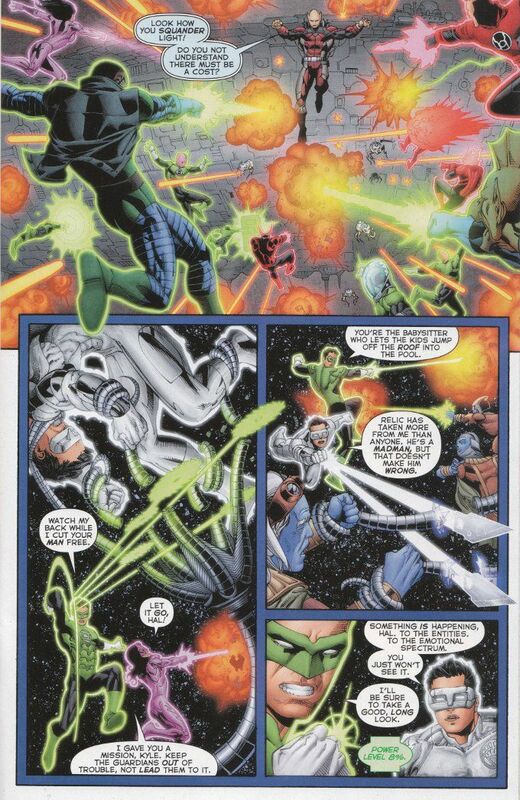 It also showed a slightly different version of Kyle Rayner's original background, with Ganthet giving Kyle some basic instruction into how his ring worked in the wake of Emerald Twilight. Then suddenly the word came from on high - Emerald Twilight never happened and Hal Jordan never went crazy and destroyed the Green Lantern Corps. So why was Kyle Rayner necessary? 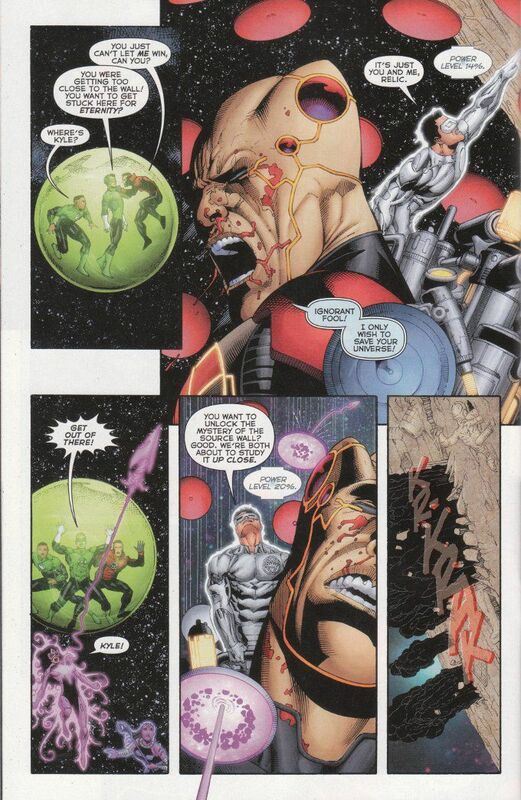 Now the story was that he was chosen by Ganthet as part of an experiment to see if one being could harness the power of multiple spectrum energies at the same time. For some reason, this retcon also required them to establish that Kyle's girlfriend Alex did exist in the new reality and that she was stuffed in a fridge... even though Major Force - the villain who originally did the deed - didn't exist in the new reality! And then Kyle was assigned the task of looking after... The New Guardians - a group of the blue-skinned aliens who founded the Green Lantern Corps who had been in stasis while their brothers set about screwing up the universe. This issue seemed to give Kyle a heroic death and a point to the sudden 180 that The New Guardians title took. That lasts a scant few pages before it reveals that - Psych! - Kyle Rayner is alive and an even greater destiny awaits him that The New Guardians have known of all this time, despite knowing very little of the universe and how things have changed until this point. Kyle should have stayed dead. And he'd be better off in limbo with Wally West, Donna Troy, Jenny-Lynn Hayden and most of the other heroes of his generation. Literally none of his background and everything that made him interesting as a character remains. Now he's just another generic cosmic hero with a destiny. 3. The Wasting Of Relic and The Absolution of The Green Lantern Corps. I liked the idea of Relic, the scientist from a previous universe who believed that his universe had been destroyed by "the lightsmiths" - his term for the Lantern Corps of his universe - slowly leaching away the energy that held the cosmos together. It was a brilliant conceit and one that gave the various Corps a common enemy to unite against in the wake of the death of The Guardians. More, there was the frightening idea - what if Relic was right? What if it turned our our favorite heroes, good intentioned as they are, were truly causing the universe to become sick even as they were trying to save it? It's the sort of idea Alan Moore might have spent years playing with, touching on issues of conservation and environmental responsibility vs. the belief in manifest destiny and the idea that such energy would not be there if it were not meant to be used. Alas, Relic is now dead and his concerns have been rendered largely mute by the sacrifice of Kyle Rayner and the emotional entities. The only real loss is that a number of the alien Green Lanterns who weren't getting any screen-time anyway have quit the Corps in disgust rather than contribute to the eventual destruction of all reality... which is no loss at all since we still have Hal Jordan calling the shots and he never really believed Relic in the first place. So really, nothing has changed at all save the Green Lanterns are now based on Mogo instead of Oa and there's no Blue Lanterns anymore. The loss of the Blue Lanterns seems an apt metaphor for the Green Lantern books as a whole now It is a universe without hope. And that's a universe I want no part of.